Still life with mother, reading The Thorn Birds whilst her tweens acquire school supplies. I usually keep meticulous records of what I read in a given year. I relish the tracking process, seeing the list of books grow with each passing month. But this year? This year was a real rollercoaster ride—the highest of highs, the lowest of lows—and my diligent record keeping went right out the window. As such, I’ve been doing literary forensics all week in an attempt to piece together the books that were the highlight of my reading journey this year. I’m pretty sure I’ve accounted for everything, and taken only the crème de la crème to share with you. And remember, I don’t restrict myself to books that were published in 2018 … I’ll read anything if it’s good. I could have SWORN I read this last year … I could have SWORN I already ranted about my love of this trilogy, but I have searched my past blogs, I’ve searched my newsletters, and I can find no such evidence. So here we go: THIS SERIES IS SO EFFING GOOD MY HEAD IS EXPLODING JUST THINKING ABOUT IT. Yes it’s a vampire apocalypse book (think government experiment gone wrong). Yes it’s gruesome and would make Stephen King blush. But it is beautifully written and masterfully plotted. By the time the third and final installment of the series rolls through, you are equal parts desperate to know how the story ends and devastated to lose the characters you have by now fallen completely in love with. I cried at several points during these books because of the humanity on display in this bleak wreckage of civilization. If you are at ALL into dystopian fiction, you absolutely have to read this series. Like, now. Set in 17th century Amsterdam, this book revealed to me how precious little I know about this time period … when the Dutch ruled much of the world, their wealth contrasting wildly with their austerity and suffocating piety. The Miniaturist opens with a familiar enough scene: very young woman (Nella) gets married off to wealthy older man (Johannes). Soon after Nella arrives into Johannes’ elegant (but creepy) home, he gifts her with a doll house—an exact replica of his home, of which she is now the mistress. Understandably, Nella isn’t thrilled with this weird child-like gift. In fact, she’s pretty pissed off about it. But her new sister-in-law hooks her up with a miniaturist to outfit the doll house, and from there, things start getting … unsettling. The ending requires some unpacking, and I highly recommend rereading the first chapter upon finishing. Summertime makes me nostalgic, and nothing says 80’s childhood like The Thorn Birds. I picked this novel up at the library for $.50, and wondered if my middle-aged eyes could cope with the yellowing paper and tiny print, but I hung in there and was justly rewarded. If, like me, you remember your mother furtively watching The Thorn Birds series, or if you ever felt conflicted about finding Fr. Ralph (aka Richard Chamberlain) painfully hot, then you will absolutely dig this novel. The most surprising thing about reading The Thorn Birds in 2018 is just how good the writing is. I think I had mentally dismissed this novel as trashy and silly. But I was mistaken … Colleen McCullough can tell a story, and this story is full of vivid, strange landscapes, heart breaking sacrifices, and will make you thank whatever God you believe in that you don’t live in the Australian outback. Imagine if the current immigration crisis were happening not at literal borders between nations, but at the entrance to portals created by some magical wrinkle in time and space? Imagine going to sleep one night in your San Francisco apartment, and you wake up at 2am to the sound of refugees from Syria escaping war … through your closet door. What’s so riveting about Exit West isn’t the implausibility of the refugee “portals.” It’s the relationships between the refugees themselves, the terror that drives them through these mysterious portals, and the strange relationships and social structures that rise and fall as they move from place to place. The impact to the “host” countries is no joke either. Hamid somehow is able to show all facets of this very real current day problem while treating everyone involved with compassion, honesty, leaving us with a hopeful, if imperfect vision of the way forward. The Power is not just another dystopian feminist nightmare novel. The author, after all, is the daughter of Margaret Atwood, the mother of dystopian feminist nightmare novels. I have to imagine that this legacy felt heavy on Alderman’s shoulders, but she has pulled off a damn masterpiece here. After a genetic adaptation causes women to be physically stronger than men for the first time in human history, the tables get turned. And as readers, we get to observe this shift in power from men to women, and all of the strange chaos and reshuffling of hierarchy that ensues. The first and final chapters of the book are social commentary and dark satire at their finest. I loved The Powerbecause it is not a book about the gentleness of femininity or the saccharine coated promise of Matriarchy. It is a book about power. And power corrupts. I can’t wait to see what Alderman does next. 2018 brought me two novels featuring scrappy, tough little daughters of the 1970s coping with the mania of broken parents in rural environs. The Great Alone was one, and My Absolute Darling, by Gabriel Tallent was the other. Both were absolute marvels in terms of writing and vividness and believable, interesting characters. But My Absolute Darling was so devastating, so hard to read that I can’t bring myself to recommend it to you. While it’s some of the finest writing I’ve come across in a long time, it was just too painful to consume. The Great Alone on the other hand is every bit as incredible and just a bit less hair-raising. In it, Leni tries to navigate childhood while being entirely dependent on two adults who seem incapable of making good choices. When Leni’s father inherits some land in Alaska, the three of them blithely haul off to the Great Alone (Alaska’s nickname), figuring that years of car camping in the Pacific Northwest have made them perfectly suited to roughing it in a cabin in Alaska (Spoiler: It doesn’t). The story builds around this terribly unstable family unit, while weaving in a rugged, compelling set of Alaskan characters who individually warrant their own novels. And of course, Alaska itself steals practically every scene it’s in. Whether it’s Hannah’s descriptions of the fictional town of Kaneq in the glorious summers or the homicidal winters, the landscape rises up around you like virtual reality. And while you know the story is building toward something terrifying and horrendous, I was kept guessing until the very last page. This book taps into that nearly universal fantasy of escaping … of getting into your car and instead of taking the usual exit to work, or whatever it is you do on a Monday morning, you just keep driving. The reader observes a family as the father and daughter cope with the disappearance of Billie, the charismatic mother. After a year, everyone’s convinced she’s dead. But there is a whole lot more to it than that, and half of the time you’re just trying to figure out whose perspective is trustworthy. The comparisons to Gone Girl are completely legit … It’s that good and it’s that creepy. Circe. I have to say it with a wistful sigh. I absolutely, wholeheartedly and without caveat loved this book. Normally I’m not interested in novels about gods and goddesses. I somehow escaped 4 years of college without having read the Odyssey, if I’m being honest. I did have a vague association of pigs when I heard the name Circe, without totally knowing why. It turns out Circe’s most infamous talent was turning men to pigs if they dared approach her island. Not a bad skill to have for a gal living solo in the middle of the ocean. In this re-imagining of her story, Circe is a helluva lot more than just a swine magician. She is the kind of woman I’d want to be friends with—smart, resourceful, sensitive, creative, completely independent, and just a little bit dangerous if you violate her sacred boundaries. Her saga is one of crippling setbacks that she somehow transmutes into triumphs. In fact, I love the description of Circe’s island so much, I use it to fall asleep at night. Seriously! I imagine myself stranded on a lush, well-appointed island, surrounded by animals and plants who are there to support me and nourish me as I go about my goddess business. It works like a charm and I’m asleep within seconds. I lost one of my dearest high school friends on Christmas Day, 2017. I didn’t hear about his death until the 26th and it was—without question—the worst moment of my life. Then two weeks later, I lost my father. These two deaths left me hollowed out, spun out and wrung out. For months, my best friend Naomi nudged me to pick up Joan Didion’s memoir of loss, The Year of Magical Thinking. Didion had it far worse than I did—she lost her husband AND her only child. I resisted reading it because … why would I want to hear about someone else’s grief, when I was so fed up and exhausted and devastated by my own? What I now know is that some types of grief are ineffable for the average person like myself. The average person like myself needs a word wizard to articulate the emotional gutting that comes in the wake of death. Joan Didion is exactly this kind of word wizard. Her conjuring reached into the void of my own heart, giving words to the pain and confusion I’d been feeling, bringing much needed comfort. If you find yourself in the clutches of grief, you can find no better partner in the process than Joan Didion. And last, but not least, is a woo-woo self help book (there’s always gotta be one in my list). Ever feel exhausted, drained, anxious or worried after spending time with someone? And did you ever notice how no matter how much “advice” they claim to want, the story never changes … the complaints are always some variation of the same theme? And just to be crystal clear—I’m not talking about friends and acquaintances that hit the occasional life snag/crisis. I’m talking about the peeps who seem to live in a perpetual state of self-imposed trauma and crisis. The folks who could make different choices but don’t. Dr. Northrup has some fantastic options for extricating yourself (if possible) or at least establishing high and tight boundaries. 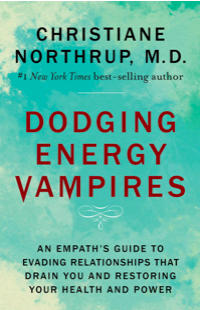 Important Safety Tip: as with any woo-woo self-help book, take the advice that works, and discard the rest, but don’t dismiss Dodging Energy Vampires out of hand because the author believes in crystals and angels. You’ll miss out on some great, potentially lifesaving information. Two very enthusiastic thumbs up from this closeted crystal, angel-loving hippy. Shine on, you crazy diamonds.